"The Coming of the Supermen" - Part 3: "Home to Krypton"
We open from where the last issue left off last month, where Kalibak had kidnapped Rafi, and Boom-Tubed to "New" Apokolips. With a little banter back and forth, Superman learns that half of New Krypton has now been taken over by the refugees of Apokolips, which turns out was destroyed by Superman in the past before the events of this story line began. Superman states that he will go to New Krypton to rescue Rafi, and also help liberate it from the Apokoliptian refugees. While the three Supermen fill in for Superman on Earth. Superman travels to New Krypton in a ship loaned to him by Lex Luthor who he had previously threatened to take down. He then calls out to Lois, whom he was aware had stowed away. He attempts to send her back to Earth, until she explains that she could look after Rafi, while he helps the New Kryptonians against the Apokoliptians. Soon as Superman arrives at his destination, he begins to fight alongside his Kryptonian kin, being a lot stronger than them, he manages to turn the tide in battle against the Apokolips side. Meanwhile on Earth, Darkseid converses with Luthor about the plans that they have laid forth. Luthor tries to double cross Darkseid, by attempting to use similar power gauntlets that Kalibak used against Superman in their previous battle, but Darkseid quickly puts Luthor in his place. Story - 4: It is evident that this issue is a chapter in the larger story that Adams has plotted. It certainly reads that way. The Bronze Age feel is still very evident in the series so far, which is a welcome change to those that may feel a little nostalgic for that era. Superman still has a bit of a jerky side to him, especially with his behavior toward the three Supermen from New Krypton. I really found it odd that he was questioning them rather violently about where they really come from, seeming to ignore the fact that they repeatedly told him that they were from New Krypton, on the other side of the sun. It isn't until the reappearance of the mysterious "Messenger," that Superman finally accepts and admits that he "knows" that they are indeed from New Krypton and also referring to them as "idiots"... Very uncharacteristic like of Superman... Then again, this Superman is rather cocky and a little arrogant� And, seeing as how this is an Elseworlds like tale, I have no problem with it. I enjoy a more confident Superman over an overly brooding and emo one. I really am still enjoying at how Adams is borrowing tropes from different eras and story lines from Superman's rich history. It is a good melding of many different eras. It's worth mentioning that Adams is fully capable of handling a large cast of characters, not just in art but in his writing also. Every character has a role to play, and is there for a reason.�Which leads me to�"Messenger" and his reappearance this issue. He was absent last months issue, as is Rafi in this months issue, so Adams appears to use his characters in a formula that is chapter specific. Speaking of a large cast of characters, it brings me to Lois Lane. We got to see a lot more of Lois in action this month. Even though she is a hard nosed reporter, Adams managed to show a side of Lois that many writers forget from time to time, which is, that she is more than willing just like Superman, to do what is right, and help those in need. I liked how Lois convinced Superman, that she could look after Rafi, while he would be in action taking down the denizens of Apokolips. And how could I not mention the revelation, that Superman dropped that he destroyed Apokolips... To quote "But... Lois we destroyed Apokolips"... Now I'm not going to jump to conclusions, and say "Superman destroyed a planet that was full of inhabitants, even if it was Apokolips"... It's obviously a plot point tat serves this story, as to why the Apokoliptians are trying to take over New Krypton... I'll wait and see if Adams will let this play out a bit more in the coming months. Lastly the Darkseid and Luthor connection... It's quite ironic that it falls this issue, after the release of the film Batman v Superman: Dawn of Justice this month (SPOILERS with its future implications regarding Darkseid). Maybe it was planned or really is an ironic coincidence... It did put a smile on my face. I am looking forward to seeing how this partnership plays out between the two villains. I like how Darkseid is one step ahead over Lex... This Devil will not be duped! We will see Orion next issue. I am a big Orion fan, so I'm excited to see what Adams has in store for him... Cant wait! Art - 5: As usual, Adams provides top notch art. The opening splash page set the tone for this action packed issue. As I have stated before, Adams is THE master of page layouts. Page 6 and 7 are prime examples of this. Most modern artists struggle to do more than 4 panels a page, Adams can seamlessly fit in 7. Just like previous issues, Adams gives us a couple of two page splash's, which look incredibly cinematic. I liked Adams rendition of Darkseid this issue, Very classic looking, however it doesn't match with the Darkseid we saw last issue... But instead of pulling him up on a continuity error, I'm sure Adams has done this deliberately... Meaning possibly that Darkseid's father is alive in this time period... And are both working together... Or possibly are working against one another. Our introduction to New Krypton, which is now half New Apokolips was very Kirby-esque. If not story-wise, Adams definitely has captured Jack Kirby's spirit in his art! Lois Lane got a little more of a larger role this issue, and it was good to see Adams rendition of her. I quite like the shorter haircut... Very Sassy! Adams had a hand this month with the inking duties from Buzz and Josh Adams. With the credits being at the end of the book, it was a surprise that he had help this month. So at least art wise, it was consistent with what Adams had produced in the last couple of issues. Which was appreciated, however, it still felt a little messy. But who am I to criticize a master like Neal Adams. Also after a little internet research, as if it weren't already obvious, both Buzz and Josh are Neal Adams sons... Keeping it in the family, I like that! Lastly on the art side of things, I have to mention the departure of the master Alex Sinclair this month as colorist. He is replaced with Tony Avina, who does a great job of keeping the coloring the same as Sinclair, with just as much flair and dynamism. The only weak point, if you would call it that is the first page, where the blue on Superman's uniform is drastically darker for no apparent reason... You could put it down to lighting, but the rest of the colors don't match, however, it's a tiny nit-pick, and is only on the first page. Cover Art - 3: Adams is the sole credit for the cover this month, however I'm sure that he didn't do the colors. Not sure if Alex Sinclair or Tony Avina. 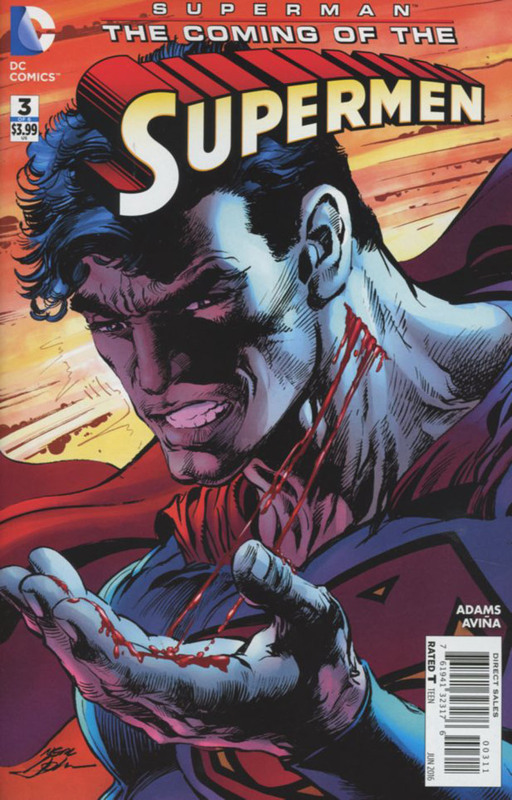 It's a close up of Superman with a cut on his neck... An event which didn't happen in this issue... Nice close up, but not the best that Adams usually provides.